20 days back in the UK. 20 days with so much to see, do and learn. 20 days to go to Legoland, pretend to be Robin Hood in Sherwood Forest and Nottingham castle, play in the snow, eat a few good curries a drink lots of decent beer (at least I did, not my 4-year-old son) and maybe find some time to relax. 20 days isn’t enough for family and friends, but then it never is. 20 days, with at least 3 spent at the wonderful IATEFL conference to meet up with old friends, made some new ones and even see the odd presentation. And in 20 days Mr T’s English went from mainly passive understanding to something approaching a more active and natural level. Before we went, I was a bit worried because although Mr T understands pretty much everything I say in English, he rarely talks in English. As my wife had to stay in Brazil, this meant he would only hear English for the duration of the stay. Would this be too much for him? Would he spend all of his time running to me to ask me how to say things in English? Would he just refuse to speak in English at all? I decided to arrive in the UK two weeks before the conference to give him time to adapt before I disappeared for the conference. I think this turned out to be a good move because for the first week or so he was quite shy about speaking English. He complained when I had to do some work as this meant he had to speak English. When I was around, he gloried in prattling away in Portuguese safe in the knowledge that I would understand everything he was saying. We had a party on the first Sunday and it took me a while, and a lot of patience, to encourage Mr T to join the other kids. He was worried about not knowing anyone and not being able to communicate. 15 minutes after he plucked up the courage to join in, he was running around and playing games just like any other 4-year-old. I was told by my family and friends that when I wasn’t around he would speak quite happily in English. Once again, it would seem it was all my fault. It was also noticeable that while he was able to communicate he didn’t have the flair and the extended utterances that he would normally exhibit in Portuguese. He wasn’t able to tell stories, be inventive or interact with adults the way he normally does in Brazil. By the end of the trip, especially over the last few days when I was away at the conference, he seemed a lot more comfortable. He was able to laugh with my family and play jokes. He sayed at my brother’s house the one night and didn’t want to leave (I think this was more to do with the fact that the stay included an afternoon at Toys R Us followed by sitting in front of the TV than anything else) with no communication breakdowns. While he still speaks to me in Portuguese, we both left the UK feeling very good about ourselves and the progress Mr T had made. In fact, he learnt so much in just 20 days that I am sure that if we were able to stay there for a couple of months he would be able to speak English as if he were an average 4-year-old British kid. I just need to find the time and money to be able to make that happen. 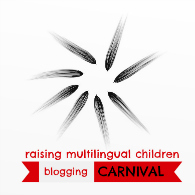 This entry was posted in A Bilingual Child, Holidays and tagged Bilingual child, Birmingham, England, Holiday in UK, UK. Bookmark the permalink.